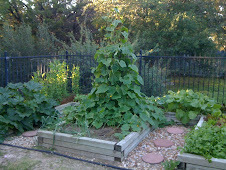 Hi, my name is Suanne and I am writing this blog to share some of the tips and recipes I have learned or created with our backyard garden. The garden itself is actually my husband John's but we have had a garden for over 25 years so I have picked up some garden knowledge along the way. We live in Austin, Texas so we are blessed with a year long growing season. We always have something to eat from the garden and this pretty much dictates what we eat. All of our meals are planned around what happens to be growing at the time. One of the biggest challenges is what I like to call crop maintenance. What to do with all of the vegetables? Beyond sharing with the neighbors and friends I am always trying creative approaches to preparing the bounty. So the blog seemed like a good way to both keep track of and share my recipes. 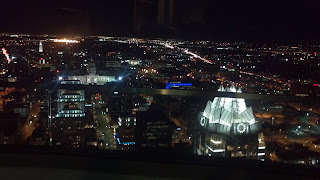 Austin Food and Wine Chef Inspiration Dinner with Chef David Bull. John and I were lucky enough to attend a wonderful dinner at the 55th floor of the new Austonian Building. It was a fundraiser for the Austin Food and Wine Alliance. For this series of events the Chefs are asked to prepare a menu of what inspires them. In this Case the Chef David Bull drew on his family for his inspiration. He prepared dishes based on childhood memories at his Grandparents restaurant in New York which was a family run enterprise. Needless to say it was fabulous from the Negroni cocktails and Pepperoni soup to the Veal tenderloin and Godfather cocktails which ended the evening. All with the spectacular backdrop of the Austin Skyline. A night to remember.